What.cd is an exclusive, invite-only music BitTorrent tracker and community. If you’re trying to get an invite to What.cd you have two options: score an invite from an existing user or go through an interview process via IRC and get invited by a What.cd staff member. Here we’ll focus on the latter of the two methods. 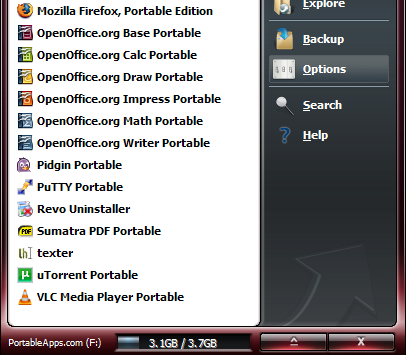 The PortableApps.com Suite, a full-featured app package that runs from a USB drive, has upgraded with a crisper-looking and more customizable menu, the latest versions of a ton of great freeware, and other improvements. A new theme brings some transparency, mouse-over effects, and display improvements to the PortableApps menu, but the release notes bury the big news—you’ll be able to theme the suite yourself in the next release, due out in less than two weeks. The app icons on the pop-up menu can be renamed or hidden, applications can be launched as an administrator, and the menu can hide all the icons and switch wallpapers on whatever PC you’re on. A PortableApp thumb drive loaded with a customized Firefox browser, office suites, IM clients, KeePass, and other portable offerings is a great way to get things done when you’re at a computer that’s not your own—or testing out stuff on your system you don’t quite want to install and muck around with. The PortableApps.com suite comes in three flavors (basic, lite, and standard), is a free download, and launches on Windows systems only. Got a killer PortableApp setup on your thumb drive? Share the app list in the comments. Cable carriers are concerned about being transparent in the way they handle congestion on their networks, given that in 2008, the FCC sanctioned Comcast for lying to consumers about their network management policies. With a new (and potentially more network neutrality focused) FCC boss in Julius Genochowski, cable carriers are making sure that whatever they’re doing — they’re informing customers about it first. Charter’s new, $140 60Mbps tier will not have any limitations. Speeds of 15Mbps or slower will have a 100GB monthly cap, while 15-25Mbps speeds will have a 250GB monthly cap. “In order to continue providing the best possible experience for our Internet customers, later this month we will be updating our Acceptable Use Policy (AUP) to establish monthly residential bandwidth consumption thresholds,” Ketzer confirms. “More than 99% of our customers will not be affected by our updated policy, as they consume far less bandwidth than the threshold allows,” he says. Charters Acceptable Use Policy can be found here. Microsoft is so eager to make Windows 7 available to people (probably because despite ~300 million copies of Vista in use it has a negative perception) that it’s going to give away the Windows 7 beta for free. According to Ballmer, Windows 7 will be available to developers immediately, and to the general public on Friday, January 9. It will be a free download from Microsoft’s site. Windows 7 Beta has been out in the wild (i.e., BitTorrent) since December, but if you’ve been waiting fora legit copy before you tried it out, you won’t have to wait much longer (FYI… I’ve tried it and while the task bar is a bit disorienting at first it runs very fast in a virtual machine and looks generally to be solid for a beta release). What’s new in Windows 7? Under the covers it’s very similar to Windows Vista. However, aside from performancing tweaking the what is at the core of Vista, modifying the task bar and giving us virtual folders there are some new additions: Digital Living Room Network Alliance (DLNA) compliance in Windows Media Player (WMP) for easier media sharing, Bitlocker to Go for encrypting USB storage devices, Direct Access for network access without VPN, and new support for sensors and devices that will enable location-aware laptops.